There’s nothing like a rhyming muffin. Especially when the word toffee doesn’t even have a explanation in the dictionary. This tasty, confection mixed cake-good is Lewis Carroll approved. Full of fantasmagorical flavor this muffin may or may not make you taller! 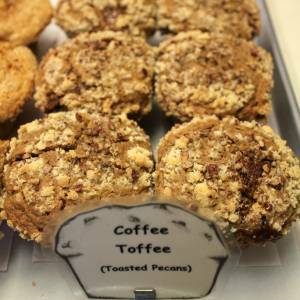 And even if it doesn’t the Coffee Toffee muffin goes great with Coffee Coffee and is the ideal treat for any rabbit-hole you may be going down.